Difficult times lie ahead for global polymer markets, as I note in a new analysis for ICIS Chemical Business. In the short-term it is clear that downstream users have, once again, been busy building stock in recent weeks as the oil price rose. But now, finance directors are getting calls from their bankers asking about working capital levels. It would be no surprise if demand soon slackened off again ahead of the seasonal summer slowdown, as this excess inventory is unwound. Unfortunately, the post-Crisis meddling by central banks has increased the potential surpluses, by destroying price discovery in key markets. High oil prices were never justified by supply constraints. But, understandably, producers assumed new supply was needed, and rushed to expand production. “In a first, U.S. oil-and-gas companies are on track this year to export more propane than the next four largest exporting countries combined—OPEC members Qatar, Saudi Arabia, Algeria and Nigeria, which have long dominated the trade… U.S. exports already account for more than a third of the overall market for waterborne shipment”. And, of course, cheap PP can often replace polyethylene and other polymers in certain applications. So in turn, this will further pressure all the new PE capacity now about to come online on the US Gulf Coast, by reducing potential demand for the new product. Please click here to read the ICB article. And please do contact me at phodges@iec.eu.com if you haven’t yet ordered the Demand Study, and would like further details. Yet at the same time, oil storage is filling up all around the world. The US surplus is so large that a futures market in storage opened last year, with 25 million barrels now being traded. And 90 million barrels are currently stored on ships, according to the latest report from the International Energy Agency – 48mb are now being stored off Singapore, for example, whilst tankers are waiting a month to discharge oil at Qingdao in China. And this oil is costing its owners money to store. On Friday, the Brent one-year ahead price for July 2017 was only $3.15/bbl higher than today’s price, far below the $10/bbl needed to make a profit. This contango has more than halved since January, despite all the talk about supply disruptions. Oil and gas are also losing market share due to climate change pressures. The US added more renewable power sources to the grid than gas last year, as major users of electric power such as Google pressured utilities to use solar and other renewable sources. Thus gas prices at Henry Hub have actually been below coal prices for the past 3 months – despite it being the winter season – as producers became desperate to sell their product. This tells us that the current oil market rally is living on borrowed time, due to these supply/demand pressures. The rally’s only support is from pension and hedge funds – seeking a store of value against dollar weakness – and from traders such as Glencore hoping to exploit short-term production outages in a major market. Most traders that I speak to therefore believe that anyone holding large inventories today is playing a dangerous game. Common sense tells us that it is very easy to build a large position in an over-supplied market. But experience suggests it is much more difficult to then sell these volumes at a profit, when the market is fundamentally over-supplied. But then reality began to return, as the Great Unwinding of stimulus policy began to have its effect from August 2014. And so anyone who began work within the past 15 years, has only known a world where market forces could be overwhelmed by central bank stimulus. 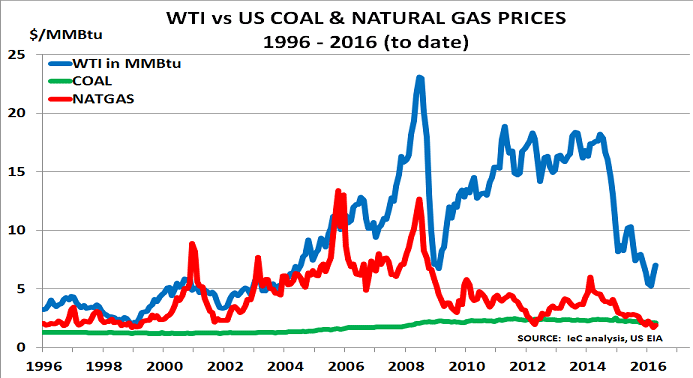 This is why the chart of WTI prices versus US natgas prices is so important. It reminds us there is is a real world out there, where consumers will not continue to pay more for oil than its relative energy value. And the oil price downturn since August 2014 also reminds us a new era is likely dawning in energy supply itself. US WTI prices were only decontrolled in 1981 under President Reagan, having previously been set by the Texas Railroad Commission (whose system of “prorating” provided the basis for OPEC’s operation). Now it seems OPEC’s role is following the Railroad Commission into history. Saudi Arabia and the GCC countries have recognised this for some time – and it will likely become more apparent to others in 2016 as we move into the New Normal world. Today’s uncertain economic and oil price environment has created chaos in petrochemical feedstock and product markets. This creates major risks for producers, consumers and investors. Can companies still plan ahead for demand by simply using a relevant multiple for each product in relation to an IMF GDP growth forecast? Can they continue to assume that oil prices will inevitably return to recent highs, or are prices more likely to return to the lower levels seen before 2004? Do China’s New Normal policies mark a complete change of direction from its previous role as the manufacturing capital of the world? Will today’s globally ageing population maintain the same levels of demand for autos, housing, electronics etc as in the past? Should companies focus on new growth areas for demand, in potential megatrend areas such as water, food, shelter, health, mobility and the environment? Our analysis will therefore explore the critical challenges that confront the industry today. It is titled How to survive and prosper in today’s chaotic petrochemical markets: 5 Critical Questions every company and investor needs to answer. Please click here to download a copy of the Prospectus. And please click here to see an interview with Will Beacham, deputy editor of ICIS Chemical Business, where we discuss the key issues covered in the Study. Suddenly, far too late, the world is catching up with reality. Goldman Sachs and others yesterday halved their forecast for Brent oil to $42/bbl from $80/bbl. But this isn’t forecasting, this is simply catching up with events long after they happened. Brent, after all, opened at $45/bbl this morning. As readers will remember, I forecast back in August that Brent oil prices were about to fall to “at least $70/bbl and probably lower“. I coupled this with a forecast in early September that the US$ was about to see a “strong move upwards“ as the Great Unwinding of stimulus policies began. Then in October, I published my original forecasts in a Research Note, and also highlighted the key issues in the Financial Times. “Astonishingly, most commentators remain in a state of denial about the enormity of the price fall underway. Some, failing to understand the powerful forces now unleashed, even believe prices may quickly recover. Our view is that oil prices are likely to continue falling to $50/bbl and probably lower in H1 2015, in the absence of OPEC cutbacks or other supply disruption. Critically, China’s slowdown under President Xi’s New Normal economic policy means its demand growth will be a fraction of that seen in the past. 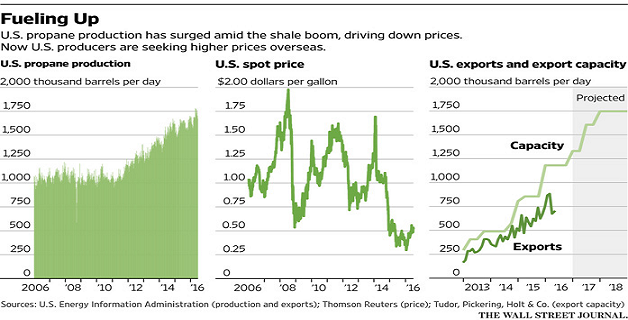 “This will create a demand shock equivalent to the supply shock seen in 1973 during the Arab oil boycott. Then the strength of BabyBoomer demand, at a time of weak supply growth, led to a dramatic increase in inflation. By contrast, today’s ageing Boomers mean that demand is weakening at a time when the world faces an energy supply glut. This will effectively reverse the 1973 position and lead to the arrival of a deflationary mindset…. “Asian producers and traders now have large inventories of almost every oil-related product. Buyers have simply stopped buying in recent weeks as prices have collapsed. So the question is whether China’s demand will now increase in January, before markets close for Lunar New Year in mid-February. A lot of money is now riding on this issue. If these hopes prove false, and the West enjoys a mild winter, there would seem little to stop prices heading back towards historical levels of $25/bbl – $40/bbl. This would be good news long-term, as $25/bbl is an ‘affordable’ price for the global economy, at 2.5% of GDP. That was published a month ago, not yesterday. Today it is clear there has been no increase in China’s demand ahead of Lunar New Year, and the West is having a mild winter. So the price is now highly likely to return to historical levels of $25 – $40/bbl. All these experts who have missed the obvious for so long need to look at themselves in the mirror, and ask the simple question, “How did we get this so wrong“? And more importantly, “What are we going to do now, to help those who believed our forecast and now face bankruptcy“? Equally, Western central banks must now give up on the myth that printing money can somehow create demand and inflation. They are primarily responsible for this looming earthquake by creating the ‘correlation trade’ in the first place. As the chart shows, this caused oil (red line) and stock market prices (blue) to rise exponentially together. Changes of this magnitude lead to a vast number of unexpected consequences, some good and some bad. And even good changes, involving an increase in demand, create major disruption for both producers and consumers. A blog reader has thus suggested that the adjustment process followed by hydrochloric acid (HCl) could be a useful Case Study. The idea is to illustrate the opportunities and challenges created by this revolution in energy supply. As a result, supply/demand fundamentals for HCl are going through major change. One key issue is that around 75% of all HCl has historically been used internally by companies for PVC and polyurethane production. Only 25% has gone onto the external market for water/swimming pool disinfection, steel pickling, food processing and other uses. Nobody had dreamed that shale gas developments would impact HCl, so producers and consumers have been running hard to try and catch up. Price volatility has thus become a major feature of the market. More recently, prices collapsed by 40% between December and May, according to ICIS pricing data. But they have since rallied 40% as the US market then became very tight, as ‘fatal’ supply was reduced by outages at Bayer and DuPont, whilst BASF’s Geismar plant has been on turnaround. A key part of the problem is that HCl logistics are relatively inefficient, as it is usually transported as a 35% concentration in water. So it can take a long time to refill supply chains, once they become empty, as an excellent report by Bill Bowen in ICIS news describes. Further volatility is likely as the year progresses, due to the new capacity due to come online. This will increase US capacity by around 20%, with most scheduled to start-up between now and year-end. Will this new capacity now create temporary over-supply, and more price volatility? Nobody knows. We are only at the very start of the fracking revolution. Today’s certainties can easily become irrelevant tomorrow. What does seem certain is that we all need to learn about what can happen when long-established supply/demand fundamentals are challenged by a major new development like fracking. The HCl market thus highlights how a company’s ability to manage today’s more volatile world is becoming critical to its current and future profitability.